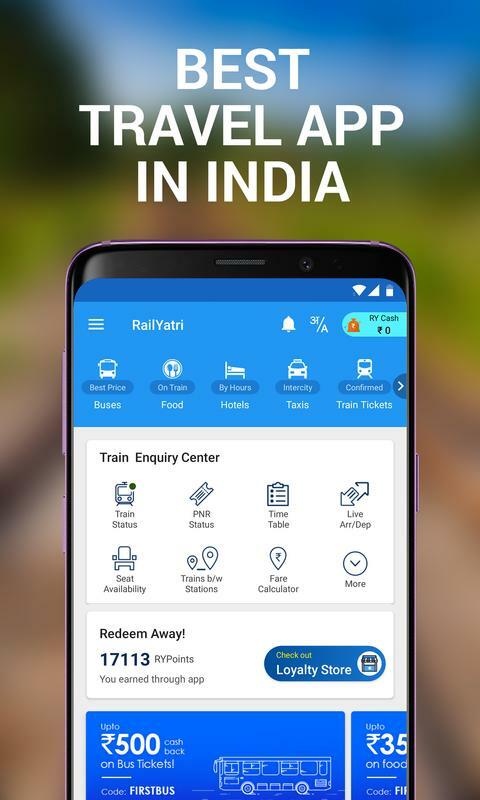 RailYatri is a complete train app which enables the users to check Live Running Train Status, check their IRCTC PNR Status, offline Train Time Table, check Seat Availability with confirmation prediction, Bus Tickets, order Food on Train, Offline GPS train status and much more. 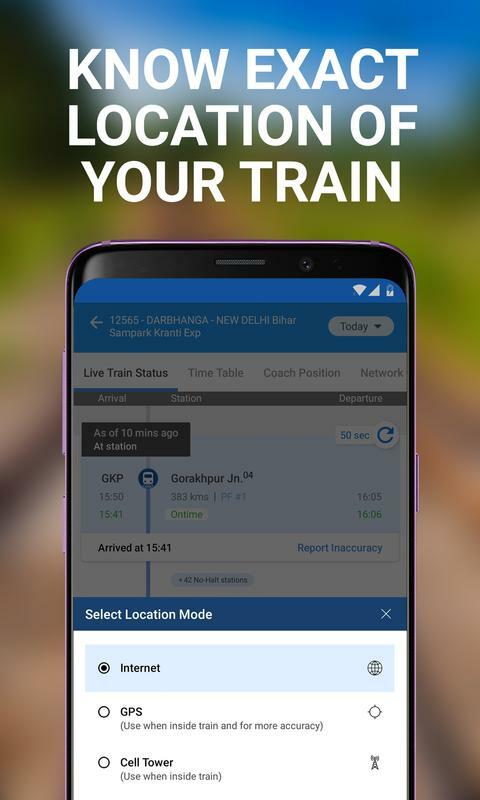 It is one of India's most trusted train apps helping more than 34 million train travellers plan their train journeys smartly and efficiently. 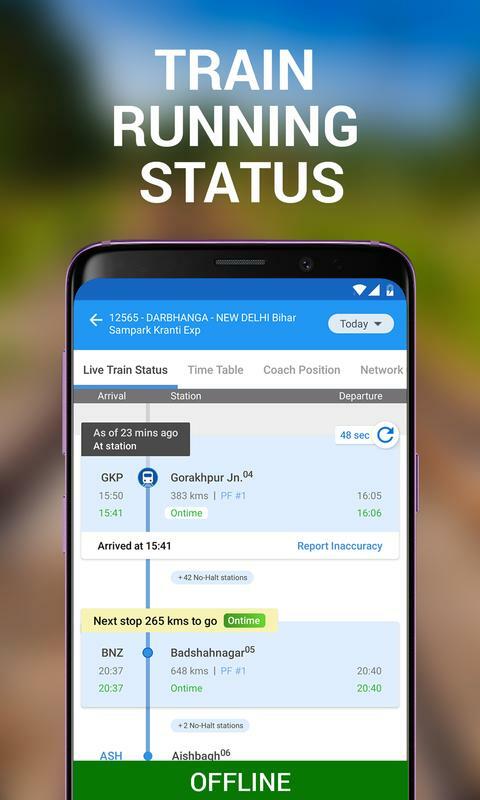 Live Train Running Status - Running train status gives current position of the train, delay or on-time information, and estimate time of arrival at upcoming stations. If you're on train, it is recommended to use GPS status for live updates. Easily check out where is the train by giving in train name or train number. 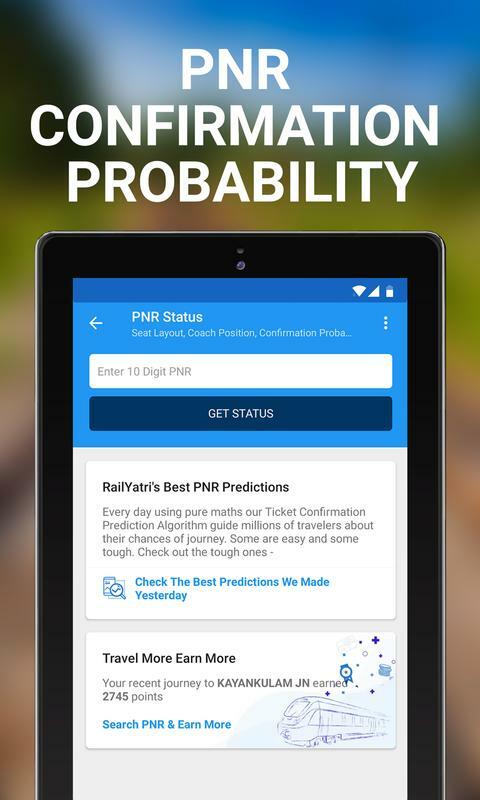 PNR Status with Prediction - Simply enter your PNR number to know all about PNR Status- current waiting list number, confirmation chance, chart preparation time, bogie number, berth or seat number etc. Check if your wait-listed PNR will get confirmed to plan better. 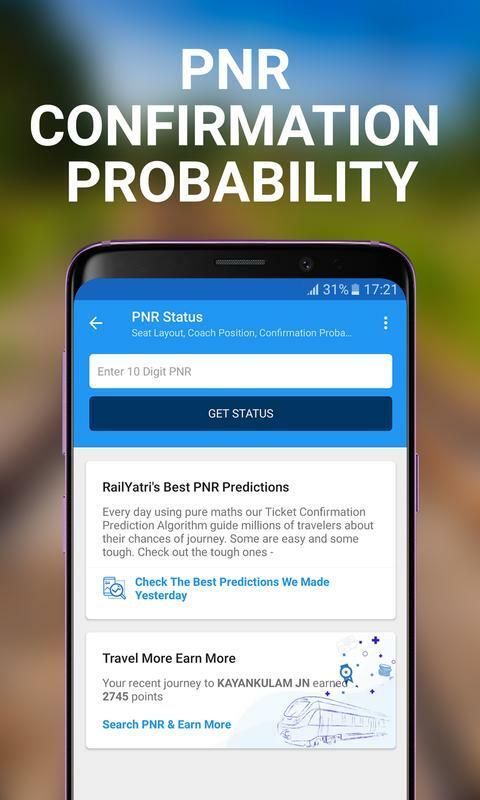 Moreover, get periodic updates about your PNR status, chart preparation status besides much more. 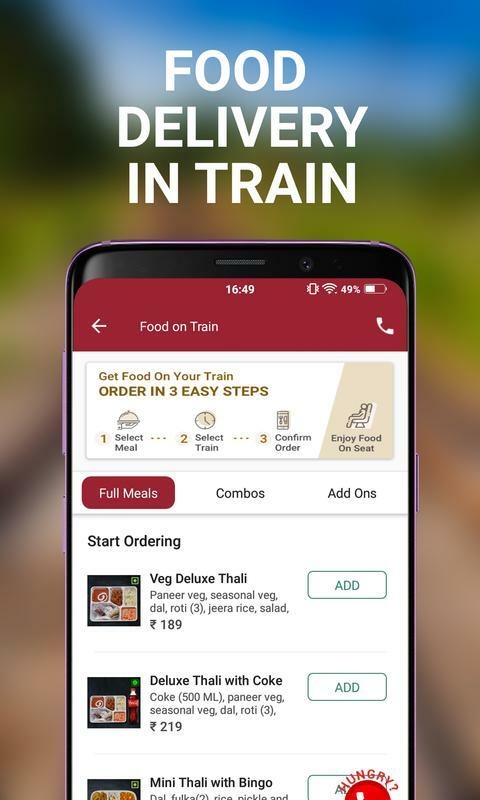 Order Food on Train - Order fresh, hot, hygienic, tasty and pristinely packed food and we will deliver it right on your berth by providing your Train Number or PNR details or both via our app. 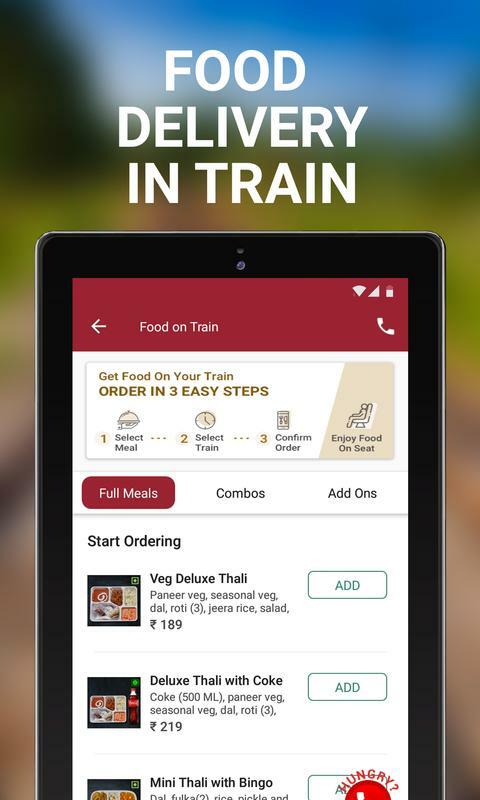 Choose from thalis, combos, quick munches or our newly launched express delivery menu. Check out for 'Order Meal' option in PNR Status detail page for quick access. 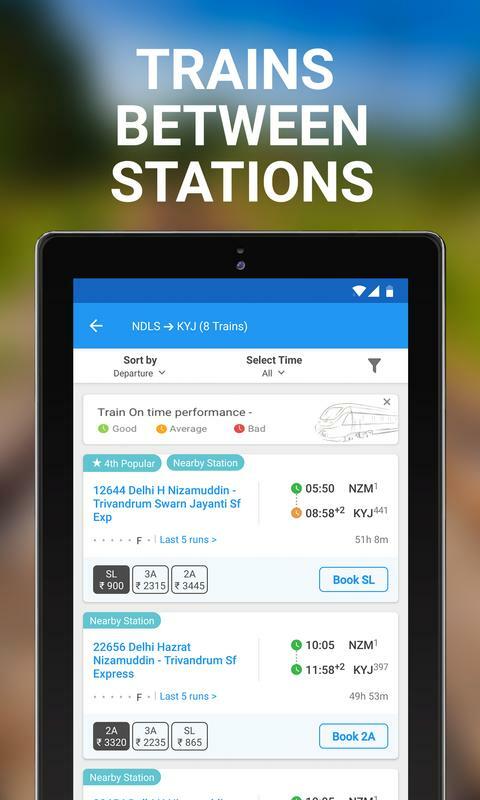 Indian Railways Train Time Table - Download once and access Time Table for offline use. Also, check the on-time performance of the train on stations. Coach Position & Platform Numbers - Find out the platform number, coach position, seat and berth layout even before boarding your train. Assistance on Train Tickets via IRCTC authorised Agents - Get assistance & human help to book train tickets. 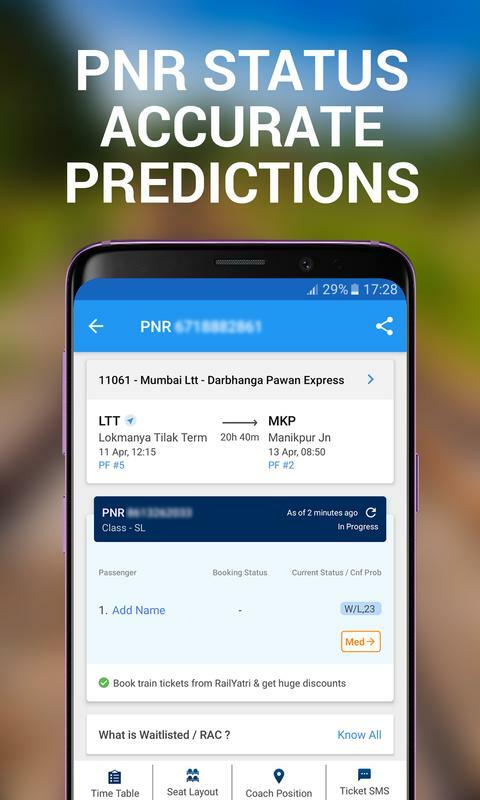 Confirmed seats availability on trains - Know seat availability & find out getting confirmed berth chances. Fare Enquiry - Know Fare for various categories and find out station to station and catering charges break up. Medical Emergency - In case of medical emergency while on train, you can now easily check for hospitals nearest to the stations on your route. RailWisdoms - Fellow travellers share wisdoms and insights from their past train travel. 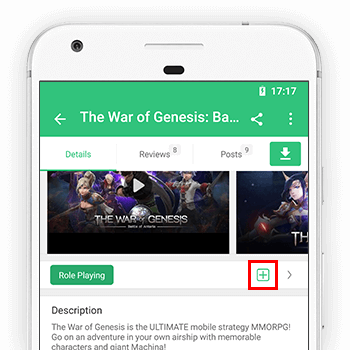 This helps our users to stay updated and plan well. Book Hotels near Station - Book hourly stays, why pay full if you just need it for few hours to fresh up and go.Try it now! 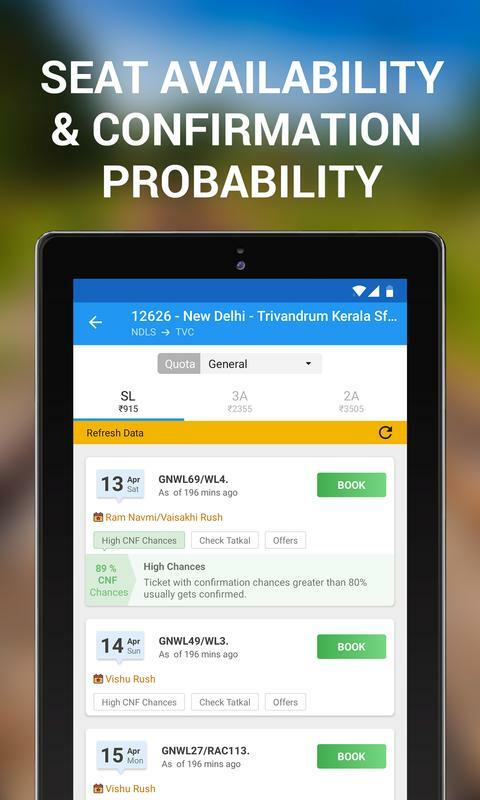 Book Bus Tickets - Now book bus tickets instantly through our trusted operators. 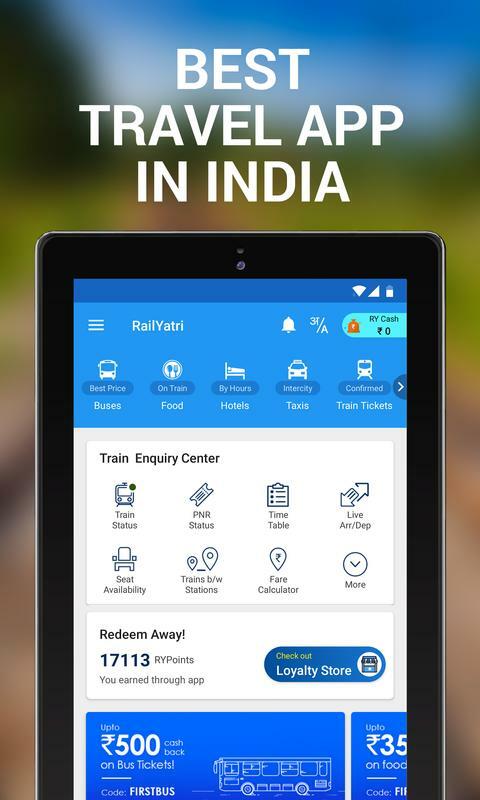 Avail upto 30% discount on your bus ticket through RailYatri. Buses plying on train routes. If you miss tatkal train ticket, do check out equally comfortable and faster buses. Book bus tickets & Save more! Automated task-reminder for your train trip - Your upcoming trip gets detected automatically from the ticket SMS. Simply paste your ticket sms in the add trip section. 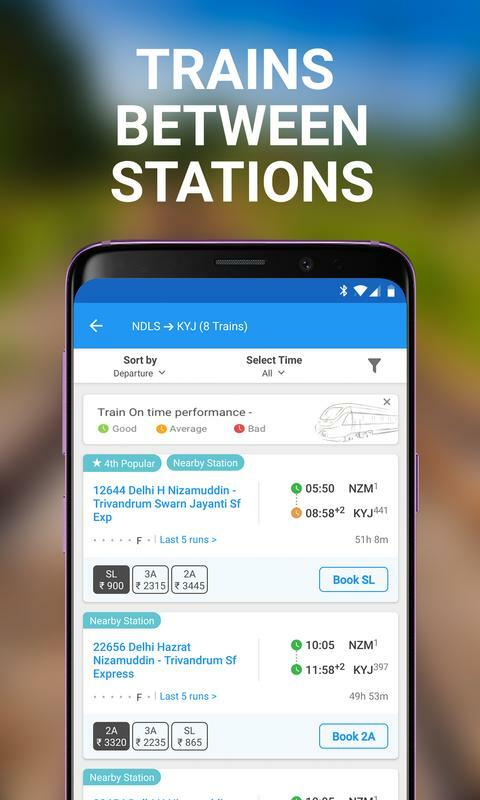 We then send you automated timely reminders on expected delays, platform and closest station entry gate, coach position, berth position, food booking reminder, wisdoms, and much more. -Please note that PNR Status service is unavailable between 11:30 PM & 12:30 AM - For any issues email us at feedback@railyatri.in & we will be happy to investigate any matter. 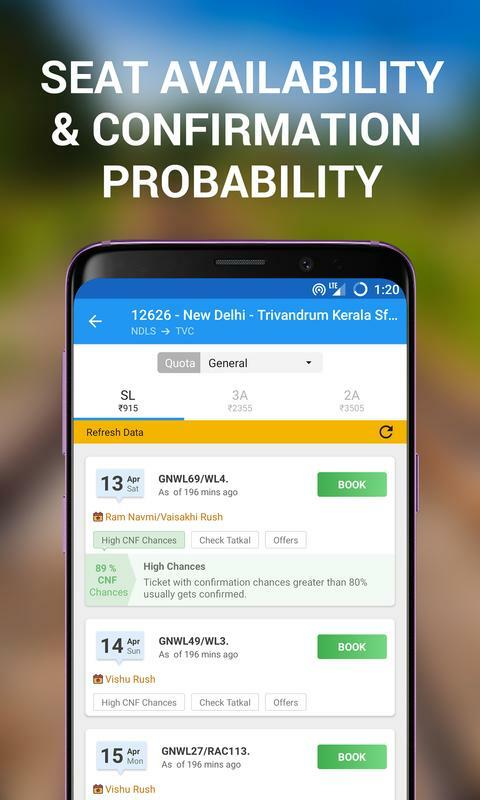 Disclaimer This app is not affiliated with CRIS, NTES or IRCTC. 1. Cell Tower Mode to track your train while on train. 2. 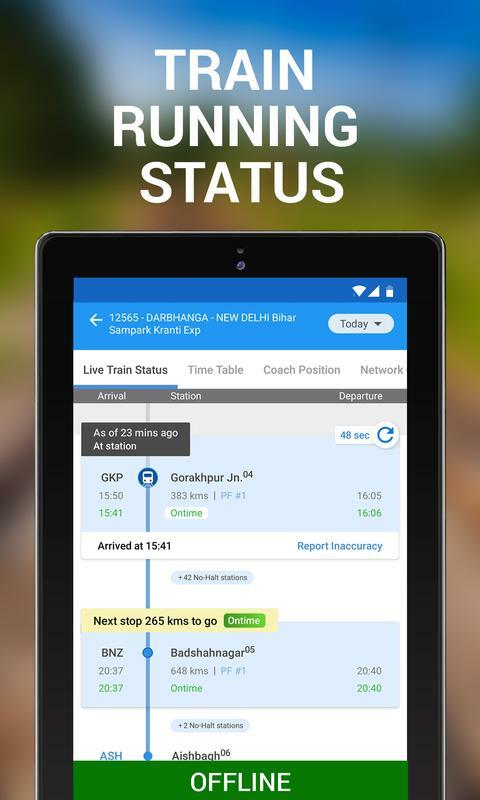 Faster Offline GPS Running Train status with faster, reliable and improved interface. 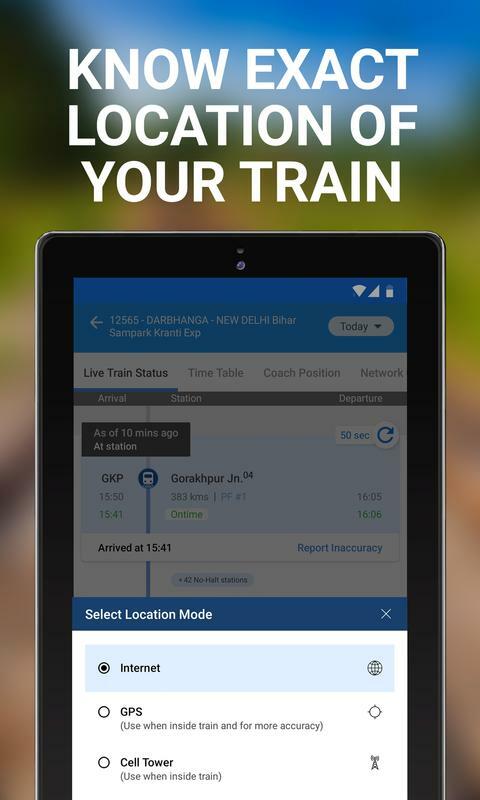 Track your train on the go. 3. Order food on train in 3 simple steps. Easy booking option.